Early July — traditionally the Fourth of July — is when wild blueberries come into season around here, replacing wild strawberries like blue follows red in red, white, and blue. Some years we’re able to eat them together with cream and get the full patriotic effect. Blueberries have seemed to arrive late this year, though, either because of the cold, wet spring or because we’ve been too busy to notice them. Last weekend, Ursula caught a glimpse of something blue in the meadow next to the pond. A moment later, she came running up to the house with ripe wild berries cupped in her palm. That’s all it took to pull out our homemade berry buckets (plastic yogurt containers strung with twine, to allow two-handed picking) and spread out to pick the season’s first blueberries. 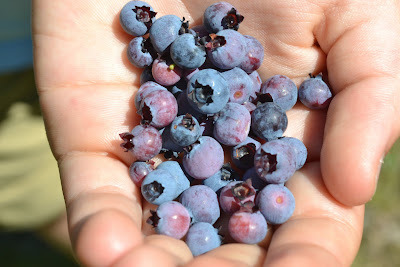 Coincidentally, I’ve been reading essays by poet Thom Rock that are all about blueberries – how they color our memories of summer, how they connect generations, what they mean to us. He describes picking blueberries alongside his mother as a little boy, the plinking sound of berries hitting the bottom of the pail, the tart sweetness of wild berries — and how, many years after her death, that sound and that taste bring back such intense memories that his mother seems to sit alongside him in the blueberry meadow once again. My own blueberry memories are of my Finnish grandmother, who stirred fat berries into her pancake batter and baked them into pies, serving up love in berries instead of words. And of my own mother reading me Blueberries for Sal, Robert McCloskey’s tale of two mothers and two young ones, all eating berries on the same hillside one summer’s day. It’s his words I use, even now, for the sound of berries hitting a pail: kuplink, kuplank, kuplunk. Ursula and Virgil have grown up hearing McCloskey’s story. Rock’s essays taught me a new blueberry story. Certain American Indian traditions say that the Great Spirit sent his people the gift of wild blueberries to feed them when they were starving. “Upon careful inspection of these heavenly gifts,” Rock writes, “a single star could be seen stamped upon each little berry, and from that day on the people called them ‘starberries.’” I’d never really thought about that five-pointed star — all that remains of the flower that begins each berry — but I’ll add the story of its origins to those I tell Ursula and Virgil. In just a few days, we’ve eaten blueberries plain and with cream and on cereal and ice cream. They’ll soon be in on the south peak of Mt. Cardigan, on the high bushes around our pond, where we can pick them from a canoe, and carpeting our upper meadow. - Read "Strawberry Moon, Moon Magic" in Great Kids, Great Outdoors.